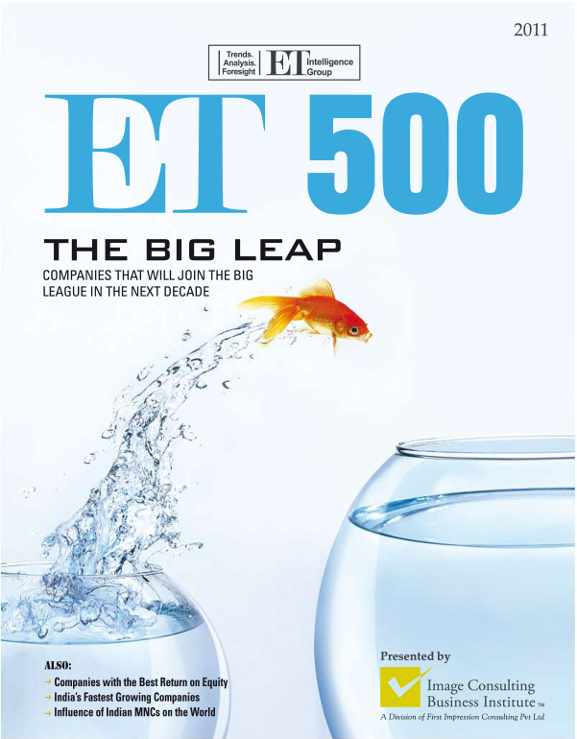 Image Consulting Business Institute is proud to be the presenting sponsor of ET 500, the magazine with the official ranking of top 500 companies in India. An annual event this magazine is almost like a bible for the corporate and management institutes. As the ET 500 list of companies gets unveiled, it’s time to look back and reflect upon the things we have done successfully in the past one year. It’s also time to look forward to the New Year and think about all the things we need to do to stand out and be counted. This includes changes we would like to see in the behavior of people dealing with us. Changes we would like to see in terms of material rewards and recognition. Changes that we, indeed, have to make ourselves before our life becomes significantly better. The truth is, people evaluate us on the basis of what meets their eye and it is up to us, and nobody else, to ensure others notice more in us. Image Management is the art and science of projecting a powerful and appropriate image so that long after a personal, professional or social meeting is over, we are remembered and recalled with admiration and likability. With the change of calendar, we hope each one of our lives will change for the better. And people will learn to assume more control of their destiny by changing perceptions around them before changing reality itself. according to me a good institute should have some basic facilities and qualities that define him. i know one institute who receives 2009 MVP Quality award from Customer Interaction Solutions magazine and customer experience and management Institute in India which provides service management courses and program.